Here We Are At Months 3 & 4! We have completed months 3 & 4 in Italy. This is new territory for us as prior to us obtaining Italian citizenship, we were only able to enjoy Italy for 3 months (90-days) on our US passport. Usually, by now we are back with family and friends telling them about our adventures. This is a whole new ballgame for us! In January, we starting planning our trip to Sicily. It was less expensive to fly to Sicily from Rome than other cities we were going to be visiting the first part of this year. So we made our plans, purchase our flights and car rental. Unfortunately, Gary wasn’t feeling well a week before but was trying to take it easy to recover. 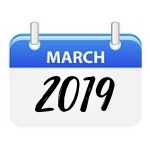 Needless to say, that didn’t happen and the day before we were scheduled to leave, I got ill. We never made it on the plane and contacted all the hotels we had booked to see if we could postpone a few weeks. They were all very gracious and allowed us to reschedule 2-weeks later. I assume it wasn’t a problem as it is winter season and not many guests visiting. It seems Rome (and some larger cities) have a company called, English Speaking Doctors in “Rome”. I was so ill I could not get out of bed so we had the doctor come to the apartment. She was wonderful and asked so many questions. Turned out Gary had an upper respiratory infection and I had bronchitis. The cost of the visit, €250 but it was well worth it. With prescriptions in hand, Gary went to the pharmacy. We were back on our feet at the end of the week but still not 100%. We had 1-week to get back to top notch for our trip. We returned from Sicily to have 1-week left in Rome before heading to Conversano. Our friend, Antonella from Milan moved to Rome while we were in Sicily for 2-months. We were able to meet for dinner to reconnect. Some people just touch your heart ♥. 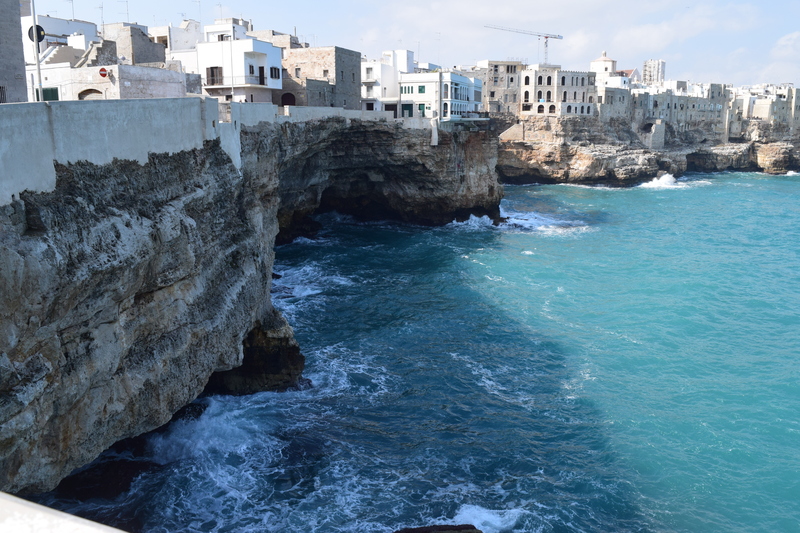 March 1st we took the fast train from Rome to Bari and the local from Bari to Conversano. We learned a big lesson on this train trip. 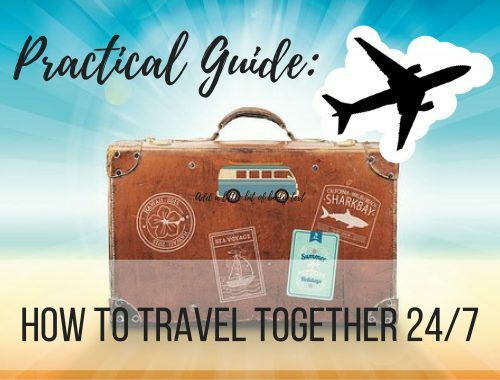 Even though we will be in Italy for 1-year, you don’t have to pack like it. We have always been so good at packing light – what happened? The first thing we did settling into our new home for 2-months was to get a box ready to send back to Arizona. Getting rid of the excess to make hauling our luggage a bit easier. You won’t believe it but the box we returned (nothing we purchased in Italy) and a few shoes came to 30 lbs! We paid €110 to ship back the same clothes we brought with us to Italy. Crazy!! 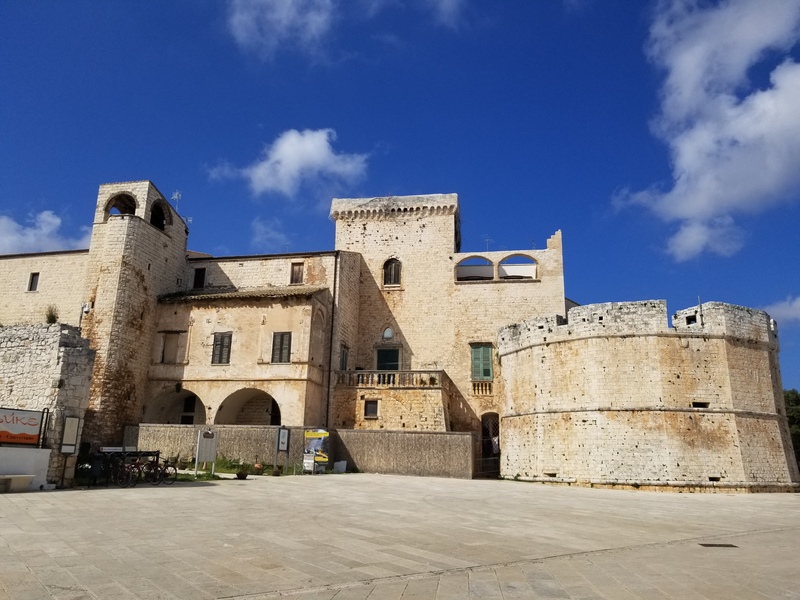 We have been in Conversano a month and it is small and quaint. The people we meet are friendly and the food in this region is amazing. The different focaccia bread is to die for! We couldn’t be happier with our house that we rented on VRBO. It actually recommended by our author friends, Nancy, and John Petralia who we have yet to meet in person but we feel like we have known them forever. This couple is the reason we decided to go to Parma, Italy for our first 90-day visit. Yup – Parma was decided from reading a book! You can find them on Facebook here Nancy & John. We are big fans of both their books (and them). Their first book is on our “FAVE TOOLS” menu. our house is the door at the end! 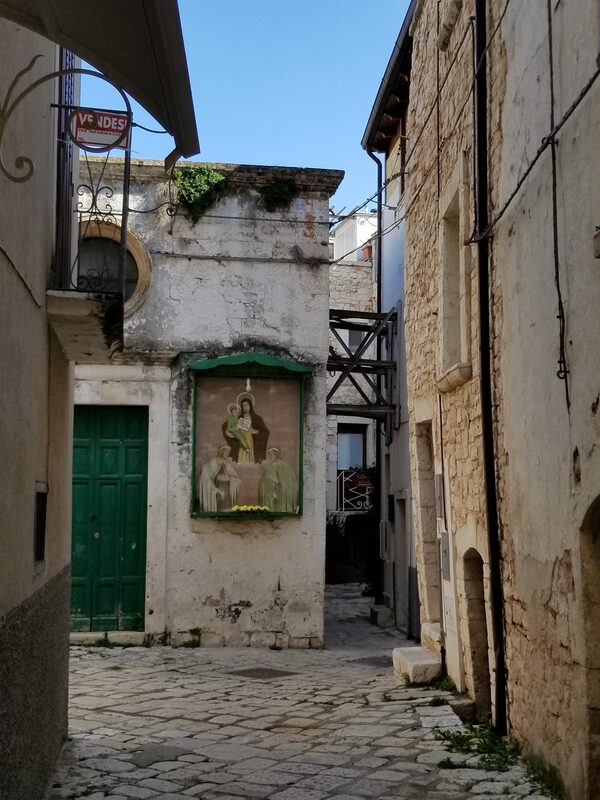 Matera is one of the oldest cities in the world and located in the Basilicata region in Southern Italy. From the Neolithic age until today (that’s about 7,000 years) human activity has been part of Matera. 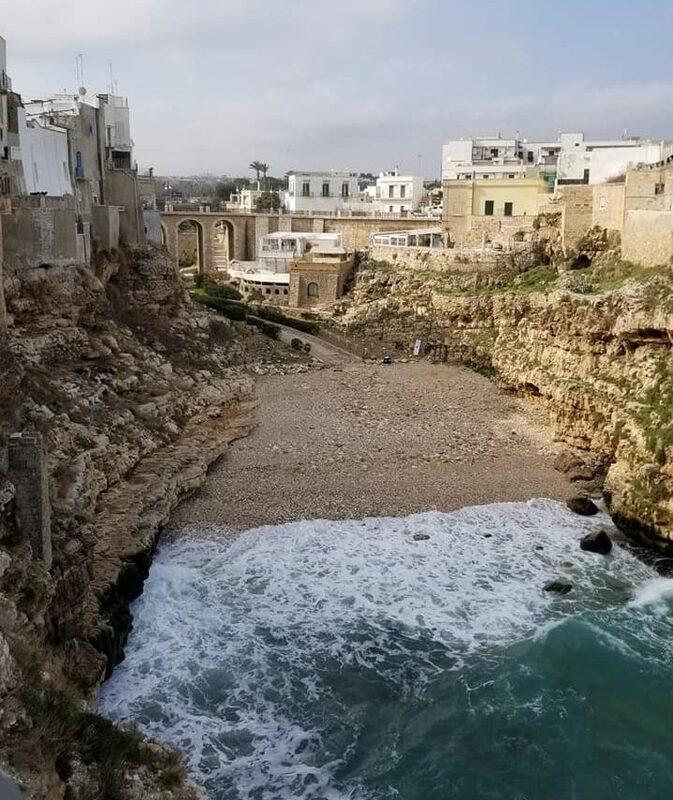 In 1952 the President of Italy closed the Sassi area of Matera where the cave houses were located due to poor living conditions. 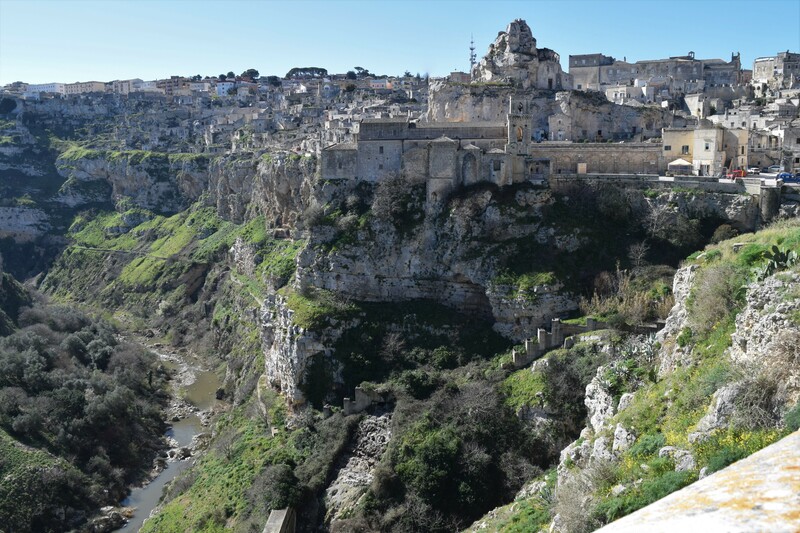 On October 17, 2014, Matera was designated European Capital of Culture for 2019. There is a lot of activity happening in this small town – major reconstruction is found everywhere! We thoroughly enjoyed our two days in this town; staying overnight in a cave, a first for us! The people of this town were so friendly; we must return especially after they have completed their construction! 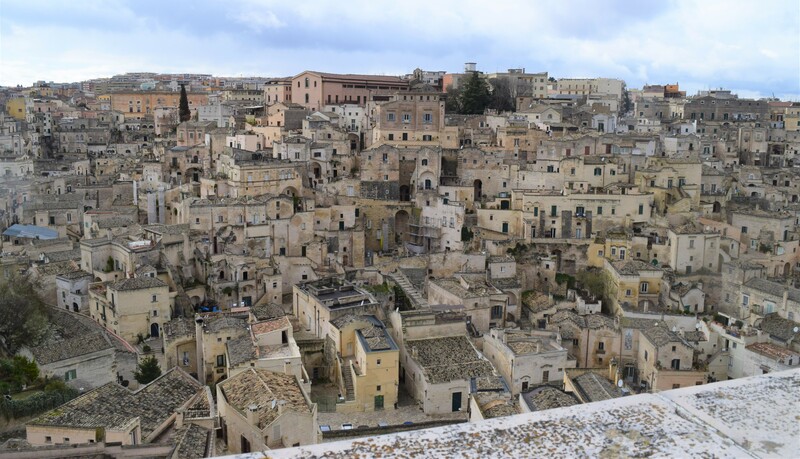 We will be doing a separate post on Matera to showcase its true beauty. We took a day trip by bus to this beautiful town on the Adriatic Sea. 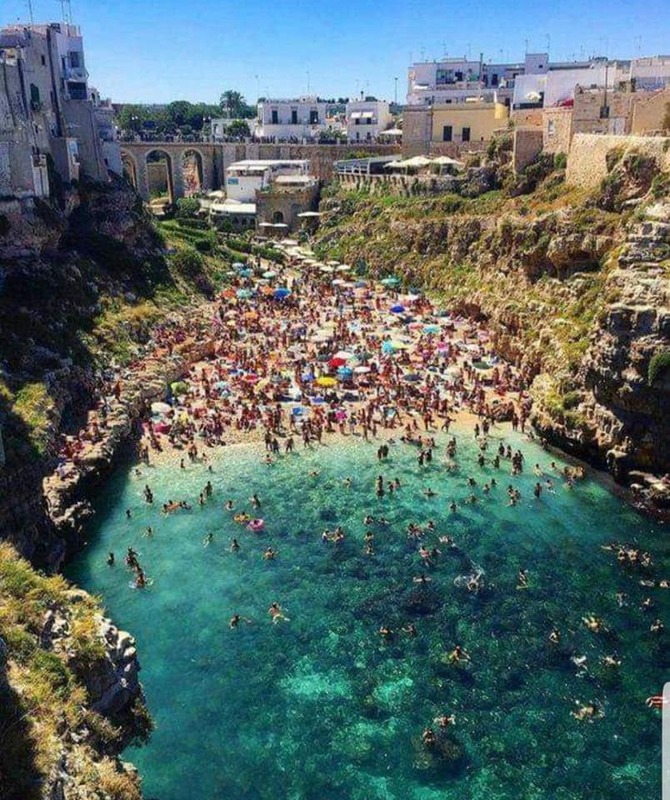 Polignano is a small town in the metropolitan city of Bari. The moment we saw the ocean, we knew what all the “talk” was about this town. The water is clear and beautiful turquoise color. The caves along the cliffs were amazing. We took the scenic walk around the perimeter of the town stopping at every viewpoint for more photos. I live in these almost every day in Italy! So comfortable and easy to wash!